I was contacted by Cindy Dyer, a fellow photoblogger, about an exciting new project she and Barbara Kelley were working on called Celebrate Home Magazine. The first issue was to feature an article on photographing Autumn colors and Cindy wanted to know if they could use a couple of my photographs she had seen on my blog. As a new magazine which would be distributed digitally, they were not able to pay for use at this time but would include links back to my website and a Bio. Normally, I am not open to such arrangements. As Cindy has been a supporter of this blog almost from it’s inception and I have done similar arrangements with other magazines which got good returns, I decided to let her use the photos. I also knew whatever Cindy does is of high quality and would have a very good chance of success. 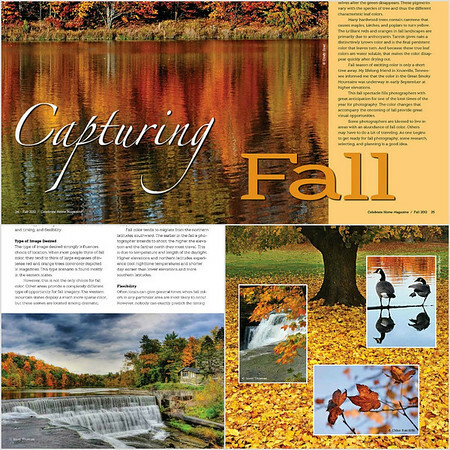 The article called “Capturing Fall” and written by Brian K. Loflin features two of my photos (see collage below) and gives great tips on how to capture Autumn in all its colorful beauty. One thing a photographer does which Brian points out is to plan. Time of day, time of season, knowledge of an area all go into the success of capturing fall colors almost as much as knowing the technical side of working a camera. For New York photographers, the I Love NY website posts a Fall Foliage Forecast every Wednesday. Brian gives many other tips to get those Pro quality results you see in magazines. 😉 Oh, do not forget a Circular Polarizing (CP) filter to cut down on glare from wet leafs. Page snippets from the Capturing Fall article in Celebrate Home magazine. My photos are in the bottom two page snippets of Cornell University’s Beebe Dam (left) and Letchworth State Park’s Upper Falls (right). As you can see by the snippets above, Celebrate Home features excellent photography and over 100 pages of recipes, homes and interesting people and can be downloaded for Free at celebratehomemagazine.com or purchase a hard copy from MagCloud. If you are interested in contributing to future issues, contact Cindy Dyer for an Author/Photographer Guide. This entry was posted in Photography and tagged autumn, beebe lake, celebrate home, cindy dyer, cornell university, dam, fall foliage, leafs, Letchworth, magazine, magcloud, new york, state park, waterfalls. Bookmark the permalink. Scott, thank you SO much for the wonderful writeup on your blog. We really appreciate the exposure (pun intended!) for the magazine and are so grateful for your involvement with your beautiful images. Here’s to our future collaborations! Hmmm…thought I replied to this. You are most welcome. The magazine is a beautifully laid out and of high quality. It would hold up against the very best on the market today. Wonderful ! Congratulations Scott. Your Fall pictures are always inspiring . I will have a look at this magazine for sure. Thanks, Isa for your comment. I know I was inspired by your autumn photos this year. That’s really cool! Good luck with this collaboration. I might just have to check this out. I assume you can read it on a pc and don’t need a device such as a Kindle? Yes, this magazine is a PDF download and can be read on a PC, laptop or tablet. Probably not something that can be easily read on a smartphone. Looks good, and I hope the publicity helps both of you. Looks like a lovely magazine and your photos were stupendous! And I agree, though sometimes a great photo is a lucky chance,most of the time it takes planning and thought. I think some people forget that planning can be very detailed or just an idea. It does depend on the subject or the thought. Hey Scott! We’ve made it easier for folks to download the free issues of Celebrate Home Magazine, include our debut issue with your photos. We have a website: http://www.celebratehomemagazine.com, where you can download the pdf for free or order print copies (at cost) from magcloud.com. Hope you’re doing well! Thanks, Cindy, updated the article with the new link. Doing great! Will be in contact soon.